IMPORTANT: A sick little boy wants to celebrate his last Christmas early…send him a card right away! Today I’m part of a bloghop with Heffy Doodle – if you came here via Lesley Oman, you’re on the right track! I’m the last stop…so if you haven’t started yet, go back to the top and hop along! 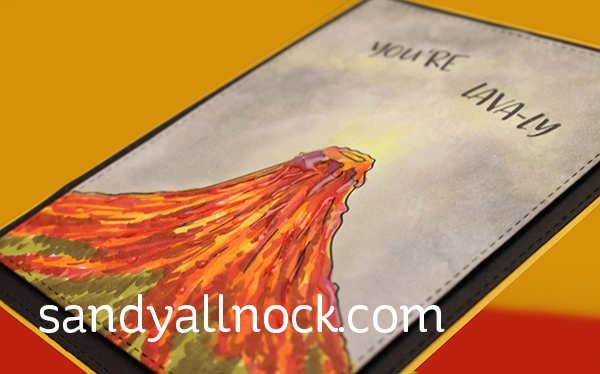 Living under a volcano – Mount Rainier – made me want to color this Geology Rocks stamp set right away. Volcanos are my favorite of all the natural disasters (ok maybe not favorite?) because they give you enough advance warning, you can run! ha! Watch the video below or click HERE to see it in HD on YouTube. Here’s a better look at the Glossy Accents – it’s scribbled on as loosely as the coloring was done! A random winner will be selected for a $25 gift certificate + free shipping to the Heffy Doodle store. Eligibility: Comments must be left by 11:59 PM PST on 11/7/2017. 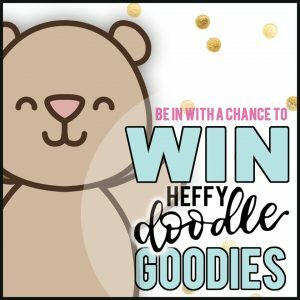 Winners will be announced on the Heffy Doodle Blog! Beautiful card you make coloring look so easy. Your coloring never seizes to amazing me! Thanks for sharing! Wow !! This is such a fantastic card !! This was so fun! Loved seeing you make a realistic flow come from that cute stamp. You have awesome skills. Absolutely stunning! You’re one of the best colourists (not sure that’s a word) I’ve ever seen. Every time all I can say is wow. What a talent you have. OH Sandy, always a joy to see and be mesmerized by your coloring on YouTube and it’s so fun to see your blog just burst with the colorful wonders of your art, too! We are SO very blessed to have a neighbor who is a volcanologist – seriously, until his family moved in, didn’t know there even was such a career! His stories of jet setting around the world to study volcanic seismicity and collecting chemical and data analysis are so fascinating – hee hee! He’s so down to earth and and it’s like a geology lesson for us! Fabulous conclusion to a LAVA-LY fabulous hop! What fun……I have enjoyed this blog hop….seeing all the creative samples with the new release. Loving the new Hefty Doodle releases. As always, your coloring is amazing! I love how realistic this volcano is! Great card. Thanks for including the video. It’s fun to watch you create. Beautiful coloring! I would have to say that I don’t like volcanoes. I prefer hurricanes… you have more time to get prepared. Actually volcanoes often give weeks of warning. Much easier to get out of town! What gorgeous colouring, Sandy!! Love! Very nice, I love the addition of the glossy accents to add dimension to the volcano! I always love your videos and projects! Your coloring is fantastic, as always. Love your videos! Thank you! I love this! The coloring is fantastic! Awesome card and I thought you had ruined the sky but it come out fabulous! Very cool! Love it. You’re so awesome & funny & inspiring. I look forward to your videos, and I love it when you tell us some personal info! Love it, this came out great! Fabulous card as always! Thanks for the inspiration and video. Love this coloring!! You are more patient than I!!! Wonderful. Wow! Your card is absolutely amazing!!! Love it!!! This is such a great non traditional card. Love it. Inspired!!!! Sandy this is fabulous and you always are such an inspiration! 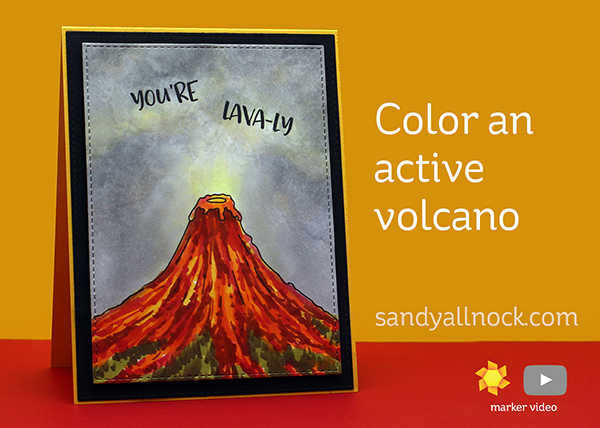 I really Lava your card! Sandy, you have outdone yourself again! I love this card! I learn so much from you every time I watch your videos. Thanks for sharing. I love watching your videos because I usually pick up a tip or an idea that I hope I remember when I need it. This time I learned, “Keep going.” It turned out beautifully. Ash, Girl, Ash! Your sky completely make sense when you figure in the ash. (I experienced the eruption of Mt. Hood in Alaska in the late 80’s) Really unique take on a really unremarkable image. Your blog keeps telling me my comment has been used before. Hmm, I’m pretty sure I haven’t commented on any other volcano post you’ve made, nor shared about Mt. Hood. Hopefully this is now enough to get by your digital gatekeeper! Update: still can’t post. I’ll try an alternate method. Yeah, but what about those earthquakes? Ash, Girl, Ash! Your sky completely make sense when you figure in the ash. (I experienced the eruption of Mt. Hood in Alaska in the late 80’s) Terrific card! Very cool how you created this volcano. What a masterpiece of art. I have to get serious with colouring. Wow. One of the coolest (well, hottest actually) things I have ever seen in my life was the active volcano on the Big Island in Hawaii. The B&B that we stayed at actually provided rain coats & flashlights because there is almost always a light rain or mist every evening, but we lucked out and had a rare night when it didn’t rain. We had to walk approx one mile over hardened lava to get to the viewing area, and once you’re there, the volcano is approx. 1/2 mile in the distance. The hardened lava was uneven and craggy so it was a challenge to walk on; plus it’s black so walking at nighttime on black lava was quite risky. I was in my mid-40’s at the time & my friends were all 10-15 years older. I was so worried one of them would fall or twist an ankle, but we all made it without a scratch. I can’t imagine how much more treacherous it would have been if it had been raining. It seemed to take forever to get to the viewing area because the anticipation was so great. When we got to the clearing, there were maybe 30-50 people there & everyone was completely silent. The lack of sound was almost eerie, but there was one sound that could be heard. It was a hissing noise as the hot, molten lava hit the ocean & steamed up. I wish I could describe how still the world seemed at that moment. It seemed as though this small group of people were the only people on earth. Off in the distance the volcano was visible. I expected to see lava flowing down the side of the volcano in thick, gloppy floes, but that’s not at all what I saw. Instead, the lava was shooting into the air making a continuous light show of yellows, oranges and reds in a display that would surpass any fireworks you could ever imagine. We’ve all heard the word, “Awestruck,” before, but I can tell you that all previous notions of that word were erased by what I saw that night. “Awestruck,” only describes a fraction of how I felt watching that wondrous display of natural beauty. That was several years ago, but the moment is seared into my heart and memory. I’m not a photographer and I didn’t take any pictures, but, honestly, I didn’t need to take pictures. I will never forget the sites I saw that night. What a fantastic experiece that must have been! Thanks for sharing! fascinating to watch your process. love the results. I love this card, how clever! That volcano looks on fire! So amazing! A really different stamp set – and a great card. Thanks for the “making skies” encouragement – I’ll try that tissue-touch technique next time I have trouble blending! Sandy, this card is fantastic! Can’t wait to watch the video later!